Welcome to the Solutions Unlimited website. My name is Pamela Milne and I have been helping people become more powerful for over 20 years. I am passionate about what I do and have been privileged to witness some amazing transformations in my individual, group and organisational clients. This is achieved by creating an honest and open relationship which challenges and resolves blocks to current performance. All of a sudden people feel calmer and more in control. This creates a solid base to start developing the increasingly sophisticated people skills which lead to achieving surprisingly positive results. Having worked with thousands of clients over the years, I have been privileged to observe their development and to recognise that their ‘issues’ nearly always concerned their ability to have a positive impact upon people. I also noticed that once initial concerns are resolved people can easily learn to become more assertive, influence effectively, negotiate win-win outcomes, conciliate between parties in difficulties, take a stand for what they believe in and finally make peace. The stability of solutions led me to develop the Continuum of Interpersonal Skills approach which became a very practical road map for developing increasingly sophisticated interpersonal skills leading to the achievement of powerfully positive results. It was one of my long term coaching clients who had been instrumental in the development of the step-by-step 'continuum of interpersonal skills' concept, who suggested that I write about my approach as my own 'development opportunity'. The People Skills Revolution and People Skills Revolution Handbook are the outcomes of this challenge. The People Skills Revolution which was published by Global Professional Publishing in 2011 is the result of this challenge. 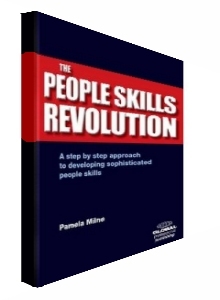 The People Skills Revolution Handbook which gives more practical examples and enables the reader to transfer the ideas from the book to the work place was published early in 2013. Explore these pages to discover more, or contact me to discuss how I can help you.